The Sports Office development team have improved the video analysis capability within our athlete management systems. This means users no longer need to upload multiple individual videos for this important aspect of sports performance management. We now accept XML files from third-party data sources including Opta, STATSport, Sportscode. Players can view footage and watch their tags in real time, to improve learning and personal development. The enhancements also include a LIVE tagging tool which allows users to view tags in real time for instant analysis, via a ‘Tagging Wizard’. Use tags to highlight in-play moments, and track total player involvement. Share video content via the Player’s App or via email, text or push notifications. Players will be able to comment both on the videos and the specified tags. One of the most exciting additional video analysis features to come from The Sports Office is the new ‘Telestration’ tool, and video annotation toolkit. Analysts can pause footage and annotate the screen with feedback for players and in-game video analysis. It is understood this function is not currently available from any other provider and these advanced capabilities are set to improve the communication of match analysis between staff and players. Create and store tags within the system that provide the data to generate reports from the ‘Analytics Engine’. Also, generate data on player engagement with video footage including views, hits and viewing duration. 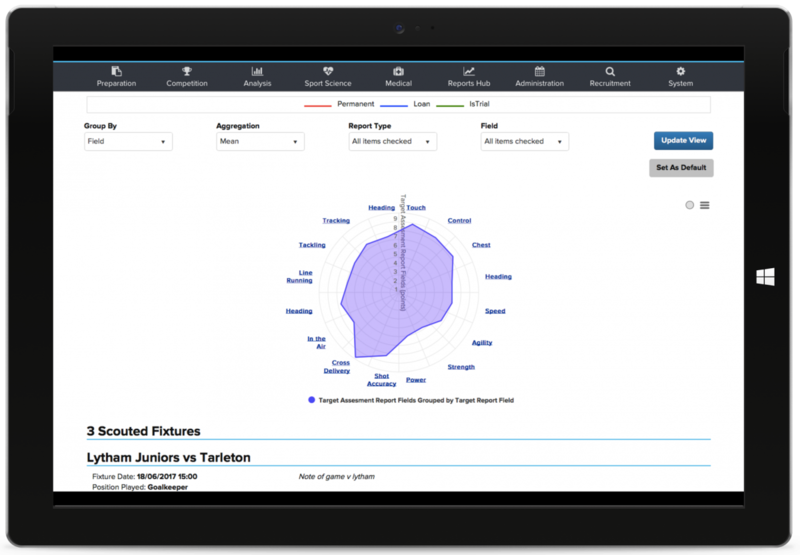 This ‘Report Engine’ functionality will aid the objective analysis of player usage. Further developments are underway for the video analysis functionality including video playlists, dashboard searches and multiple viewing angles. For more information view the ‘Video Analysis’ PDF or contact us with any questions. 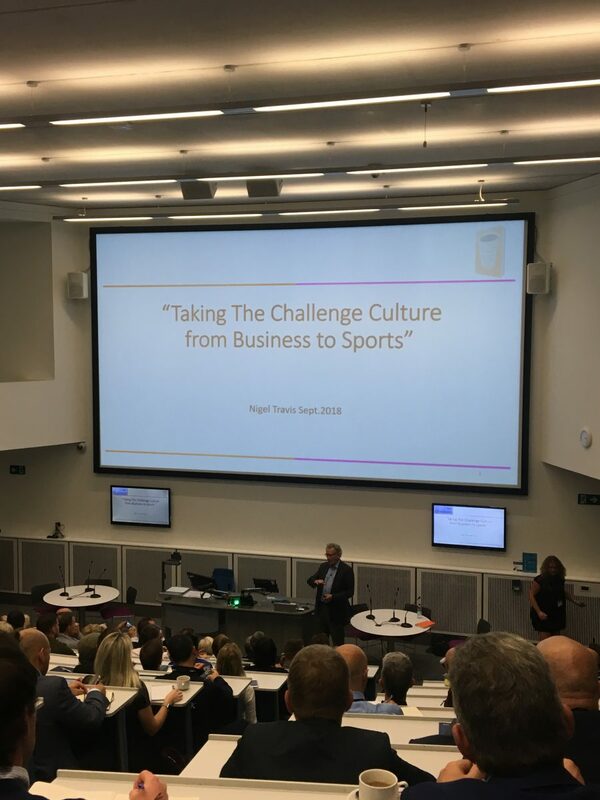 A team from The Sports Office have attended a high-profile networking and education event for leaders in elite sport. The Masters in Sports Directorship Convention was staged at Manchester Metropolitan University’s Business School. Sports Office staff were among delegates from more than 250 global sports organisations. 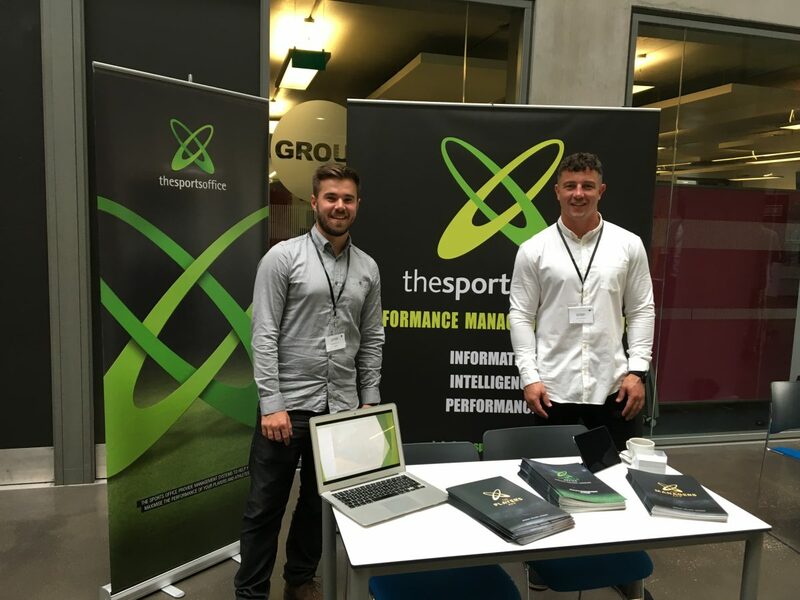 Client Manager Chris Tuson, Business Development Manager Sean Pike and Marketing Coordinator Lori Scriven showcased the company’s range of performance management systems for elite sport, including the new Manager’s App. The event also included seminars, a keynote speaker and discussion panels focusing on the role of the elite sporting director. Business Development Manager Sean Pike commented: “The event was a great success and we would like to thank all the Manchester Metropolitan University staff and all guest speakers. The event’s keynote speaker was Leyton Orient owner and Dunkin Donuts chairman Nigel Travis. His presentation focussed on successful cultures and leadership and in elite sport. The Sports Office team also attended a ‘Winning with Analytics’ seminar, hosted by former Chelsea FC statistics and analysis expert Garry Gelade. The Sports Office has recently released The Managers App. It is a bespoke mobile application to support Sporting Directors, Managers and other top-level executives in elite football. The app gives immediate access to a highly relevant and tailored snapshot of key performance data and critical management information. This enhances executive management processes and also greatly improves effective decision making and communication at the top level. To learn more about The Manager’s App please download the Manager’s App PDF and contact our Client Management Team. Following a robust development and testing process, The Sports Office has released the latest series of updates and enhancements to our Athlete Management Systems to improve player development. As part of the quarterly release strategy, both system and bespoke developments have been delivered, focusing on target player development and recovery. All of these will enhance key functions including athlete data management, athlete monitoring, training load management and sports medicine management. With updates including the Tokenisation of the site LIVE, we now offer the system fully translated into Italian and other languages on request. 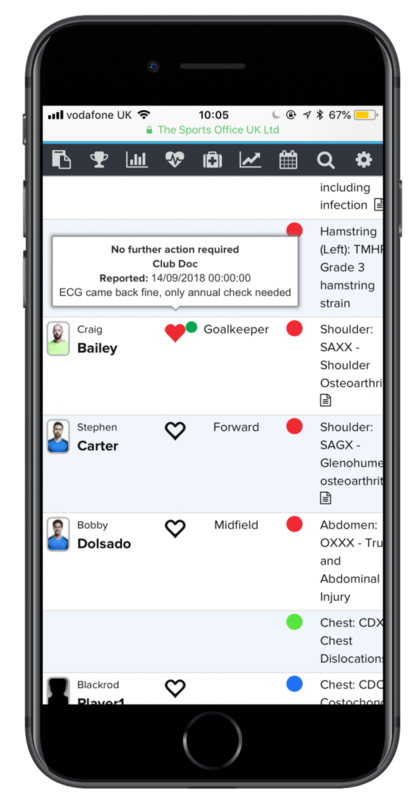 Our roadmap has taken developments through medical enhancements, designed to provide clarity for player injury data, sensitive medical information and the actions required to improve player recovery. 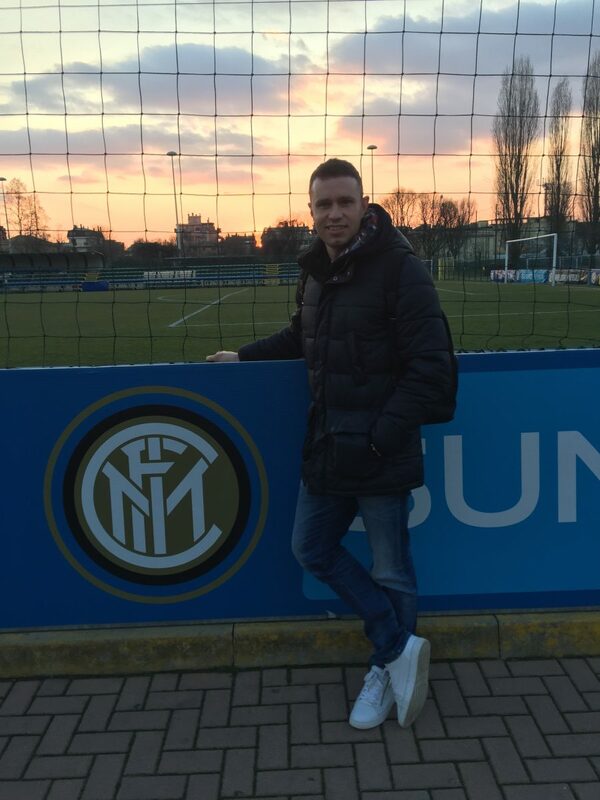 In addition to these developments, extensive video enhancements and scouting updates have been made to ease the player recruitment process. This development allows medical staff to be fully aware of the players’ Cardiac Screen within our Screening & Assessment Reports. An icon will display on the Medical Team Status page to clearly identify whether a cardiac screen has been completed and what further action, if any, is needed. Medical staff can now create different alerts for any actions that have taken place in the Medical Department. Alert users by email, text or real-time notifications if an injury has been added, edited or deleted to the system. With the new functionality, you can configure bespoke alerts for specific injuries and/or departments. Alert particular medical staff for particular injuries (e.g. head injuries) which are among common use cases. The player medical dashboard has had both aesthetic and accessibility improvements made under this development. Most notably the addition of the new feature ‘General Health’ to make complete player medical information more accessible to practitioners. A new range of features including the ability to update and review Allergies/Intolerances and Medical Alerts. These additions are alongside player Medical History and Ongoing Medications. Scouting staff can now improve player recruitment with target player spider charts. View spider charts averaging player performance statistics from each field of the report. Filter and aggregate this data in numerous ways for maximising recruitment efficiency. Searching for target player development reports has been simplified with TSO, users can now view the number of reports a player has had completed against them. With a broader range of filtering options now available, player information is more accessible and refined. The latest developments for player recruitment allow users to hide recommendation indicators of a scouting report. This functionality gives scouting staff greater flexibility for building target assessment reports. If you wish to know more about these latest updates, please contact our Client Services Team.